Product prices and availability are accurate as of 2019-03-26 15:54:35 EDT and are subject to change. Any price and availability information displayed on http://www.amazon.com/ at the time of purchase will apply to the purchase of this product. Slender Mountain Mint is a 2' to 3' tall native perennial. The common name is in reference to the narrow, almost needle-like leaves. This summer flowering plant has multiple dense clusters of small showy tubular two-lipped white flowers and has an extended flowering period. Slender Mountain Mint is adapted to a variety of conditions and will grow in dry to moist soils and full sun to partial shade. It is easily established and is a good garden plant that may form dense colonies. This plant's greatest value is as a pollinator conservation plant and is a must for pollinator plantings. Like other Mountain Mints, this species is used for herbal tea. 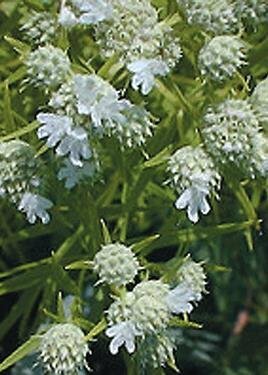 FREE SHIPPING Number of seed is Pure Live Seed, not bulk Species is US Native, not introduced alien We grow the seed so we control quality A 2' to 3' tall native perennial mint with dense clusters of small white flowers. A summer flowering plant that grows well in dry to wet soils and in full sun or part shade.